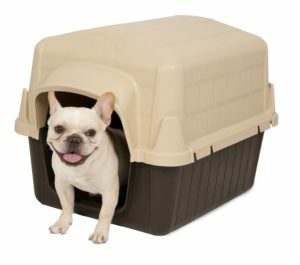 Looking for a simple and effective shelter for your dog to keep him/her safe from weather elements and undisturbed during naptime, the Petmate Barnhome III Pet Shelters have several benefits over traditional wooden shelters. 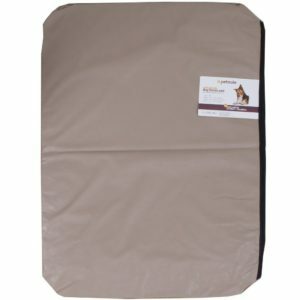 They are easy to maintain and help keep your dog cool in the summer and warm in the winter. 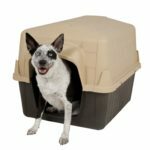 While not the most stylish of doghouses, these dog homes offer durability and protection for your dogs at affordable prices. Barn-shaped house with textured slanted roof that repels water and snow. Extended rim on roof of doorway to keep out rain. Rear air ventilation for airflow and circulation. Solid walls prevent drafts and block blowing rain. Raised interior floor provides greater warmth during winter months. Maintenance free and easy clean up. Resistant to mold, mildew and pest-infestations. 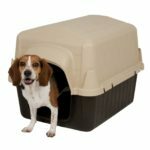 The Petmate Barnhome III Pet Shelters dog house is composed of a plastic reinforced with structured foam. This material provides for a solid wall construction that provides for an insulated environment that will keep your pet cool in the summer and warm in the winter. Plastic dog shelters have many benefits. Unlike traditional pet shelters, these last for a long time. There will never be a need to replace rotting wood, missing shingles, or split boards. There will also be no need to add additional insulation or seal holes. The homes are well insulated, so only a minimal amount of bedding is needed for added pet comfort. The lightweight design means you can easily move it into a garage or basement in the colder winter months. 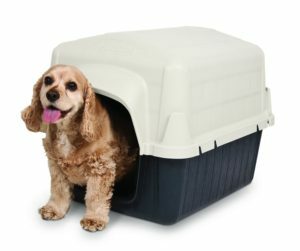 Small enough to fit on a porch or a deck, these units also contain plenty of room for most dogs. Petmate Barnhome III Pet Shelters come in a variety of sizes. When buying a dog house for your dog, one size does not fit all. Your dog should be measured for length and width before choosing a size. You want to make sure that the dog is able to turn around comfortably within the dog house. It is best to err on the caution of the bigger size as opposed to the smallest option. The doorway to the Barnhome is centered with a small ledge above it. This keeps the rain from going inside it. It does not come with a door flap, but one is available separately. The doorway is smaller than the width of the unit, but specific dimensions are unknown. The centered door has a small rim on the roof but allows for rain and wind to enter the door. To prevent the wind and rain from blowing directly on your door, you can invest in a door flap to add an additional layer of protection for your dog. The walls of the Petmate Barnhome III Pet Shelter dog house are thick enough to provide warmth during the winter. The elevated interior floor also helps. The three walls are sealed and without the gaps of traditional wooden doghouses. As a result, they seem well insulated for the rain and cool temperatures. Bedding can be added to the floor of the homes to add warmth for your bed. The homes can easily be moved into the garage, basement of inside the home for maximize protection during the coldest winter months. The pet shelters do not have any ventilation. This can cause the interior to become too warm during the summer months. But the lack of ventilation also means it will stay warmer during the winter months. The only ventilation available comes from the doorway. The easy assembly of the Barnhome makes this a great purchase. The only downside is the possibility of larger dogs inadvertently unsnapping the two pieces. This can happen if they start rough housing inside the pet shelter. This can be readily fixed by the use of some hot glue where the snaps attach. 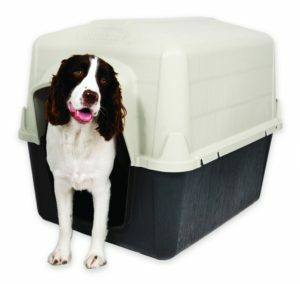 The Petmate Barnhome III Pet Shelters do not come with door flaps or interior pads. But you can get both separately. S hooks used for attaching door may need to be replaced. They don’t hold very well. 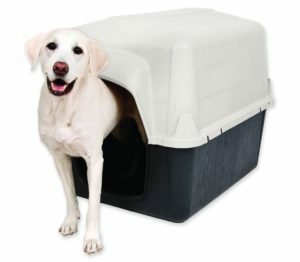 Overall, the Petmate Barnhome III Pet Shelters get very good reviews. Many customers have commented that the smaller barnhomes make excellent shelters for their feral/outside cats. Those who purchased the door flap accessory were pleased with its effectiveness but not with the attaching S hooks. Their recommendations were either to clamp the hooks closed or use nuts and bolts to attach it. The pad accessory was not a big hit with many dog owners. The main complaint was over its durability. Even the most durable dog products don’t stand a chance against most dogs. If you have a dog that loves to chew, then I would suggest loose bedding instead. Customers did like the easy cleaning of the Petmate Dog House pad. The waterproof vinyl works very well in stain prevention. These pet shelters are very easy to clean and owners appreciate their maintenance-free nature. There is no need to speed a ton of time or money replacing rotten wood, tacking on new shingles, or repairing wooden splits. You just have to rinse your doghouse down with some water and wipe with a damp cloth. You can read Petmate Barn House 3 customer reviews at Amazon. Everyone agrees this pet shelter is well worth the price. The benefits definitely outweigh the disadvantages. The downsides of the product are easy and cheap to fix. I wouldn’t purchase the accessories unless you have sedentary or smaller dogs. You can just as easily replace the door flap with a heavy mat. The padding can also be replaced with loose bedding or a blanket during colder weather. 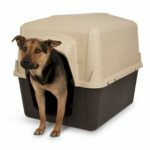 These Petmate Barnhome III Pet Shelters have several benefits. Plastic shelters are more durable and easier to clean. Resistant to mold, mildew and pest-infections. The raised interior floor keeps the inside warmer during cold weather. The slanted roof repels water. Different sizes for different dog types. Easy assembly requires no tools or manuals. Solid Walls for added insulation from the weather elements. No paint fumes or wood odors. Does not leak when it rains. Accessories to make your Barnhome complete. Some of these are easily fixed. No doorway dimensions. To keep your dog from crawling, you should measure its height and width. Centered doorway allows cold drafts and rain to blow directly on your dog. This can be fixed by purchasing the door flap accessory. No ventilation. The only time I would be concerned is in the summer months. Placing the pet shelter in a shaded area can keep it from becoming too hot. S hooks for door flap accessory are not very secure. Clamping the S hooks closed can be an alternative solution. Barnhome pad accessory is not puppy resistant. Dogs that chew or “nest” may wear out the pad. Another alternative is to place a blanket or loose bedding in the pet shelter. Not as stylish as other doghouses. The Petmate Barnhome III Pet Shelters is not one of the most fancy dog houses, but I think this one is very practical. 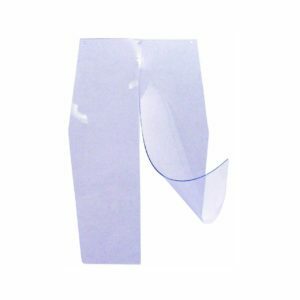 The plastic material is durable and easy to clean. It comes in a variety of sizes for different dog breeds. I like the innovative ideas other customers have for its use as well. If you have any outside cats or, like me, a few feral ones running around, the small ones are perfect for them. Cats are definitely easier on the accessories. I think they would appreciate a nice comfortable pad to lay on during those cold winter months. Outside dogs usually have enough winter fur to make the padding unnecessary. Some loose bedding will help the smaller ones stay warm. Overall, I think it is a practical purchase and will serve your pet well for years to come.